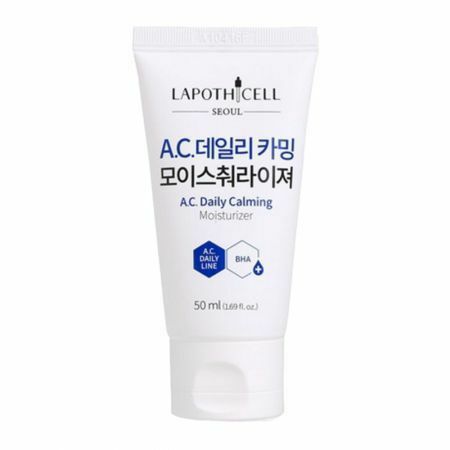 "The LAPOTHICELL A.C Daily A.C Daily Calming Moisturizer is a hydrating and gel textured moisturizer with antioxidant (BHA) and 20 natural ingredients which aid sebum level correction and skin hydration. It is an ultra-light moisturizer that melts on your skin, leaving you with a fresh sensation. It contains wintergreen leaf powder, tea tree oil and other herbal ingredients that help antibacterial action, and is specially formulated for the sensitive normal to dry skin types. It is recommended for oily and combination skin, sensitive skin, normal skin types. Does NOT contain Parabens, Artificial Colorants or Artificial Fragrance. Direction for Use: Squeeze out a generous amount on your palm, and then apply on face once every morning and night. " "Water,Glycerin,Alcohol,Propanediol,1,2-Hexanediol,Peg-40 Hydrogenated Castor Oil,Phenyl Trimethicone, Carbomer,Tromethamine,Sclerotium Gum,Ethylhexylglycerin,Citrus Aurantium Dulcis (Orange) Oil,Disodium EDTA, Citrus Medica Limonum (Lemon) Peel Oil,Citrus Aurantium Bergamia (Bergamot) Fruit Oil,Allantoin, Gaultheria Procumbens (Wintergreen) Leaf Extract,Portulaca Oleracea Extract,Butylene Glycol, Lavandula Angustifolia (Lavender) Oil,Pelargonium Graveolens Flower Oil, Ocimum Basilicum (Basil) Oil, Ceramide NP,Hydrolyzed Hyaluronic Acid,Aloe Barbadensis Leaf Extract,Anthemis Nobilis Flower Extract, Salix Alba (Willow) Bark Extract,Salvia Officinalis (Sage) Extract,Melaleuca Alternifolia (Tea Tree) Leaf Extract,Beta-Glucan"